A design studio is a group brainstorming session where participants sketch, share, and iterate in order to explore various design directions and come up with new ideas. Usually, design studios are held at the start of a project. In my case, however, my mentor suggested that I hold one during a transitional phase in my summer project. I was shifting mediums from a somewhat static text document to an interactive web app, and wanted to get some fresh perspectives and energy. My Viget colleagues were eager to help out, and I managed to put together a diverse team spanning design, development, business development, and user experience across our different offices. This added a challenge—running a design studio remotely—but the result was well worth it. I couldn't have asked for a better group. Today I want to share five things that helped our remote design studio run as well as it would have in-person. 1. Keep sketching rounds short. The key mechanic of design studios is taking participants through a series of problems, features, or design explorations that you want them to sketch. These repeated sketching rounds can get tiresome, especially in a remote setting. 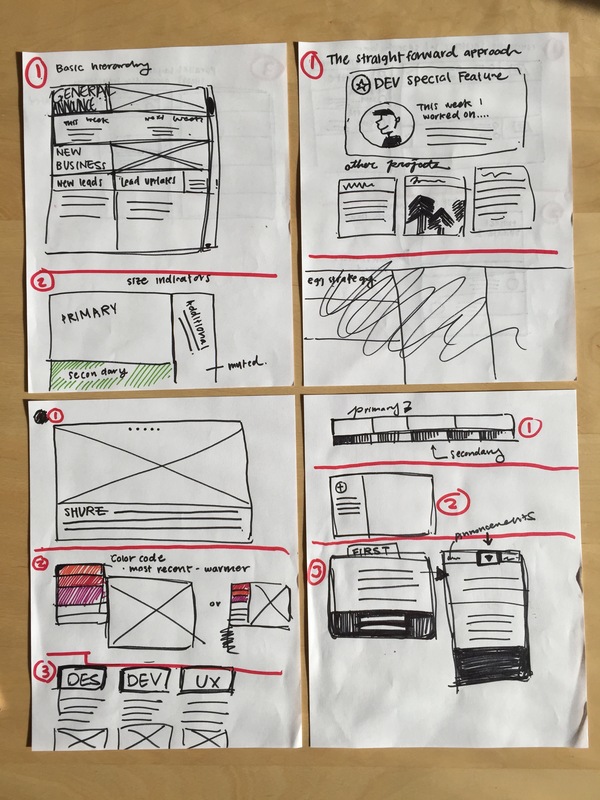 Help your participants stay engaged by keeping sketching rounds short and efficient. I booked a two-hour slot for my design studio and wanted to iterate through five design explorations. I reserved 15 minutes at the start of the studio to introduce the project and outline our goals for the day, 20 minutes for each of the five design explorations, and five minutes to wrap up. In each design exploration, we spent two minutes going over the prompt and guidelines, five minutes sketching, and the remaining 13 minutes sharing and discussing our ideas. I asked participants how the timing felt after the first round, ready to make adjustments as needed. You should aim for a rapid, though comfortable, pace. Assessing body language and posture is more difficult in remote settings than in-person, so as a moderator, you need to be especially cognizant of how your participants are doing. Ask your participants to turn their cameras on so you can tune into their behavior as much as possible. It’s easier to check whether folks are bored, tired, or restless when you can see them on screen. 3. Use the right technologies. My colleagues here at Viget collaborate so efficiently across three offices in part due to using the right tools. Laura Sweltz, a UX designer at Viget, pushed me to think just as critically about the digital tools I planned to use during my design studio. In person, you don’t need much more than paper and markers to run an effective design studio. When brainstorming remotely, though, you need to provide a means for participants to share their sketches with the group. I considered having each person hold up their sketch on camera, but I wanted my own record of everyone’s work. Instead, I decided to leverage our team's Slack account and had everyone upload their sketches to a group chat room. I then shared my screen via Google Hangouts and cycled through the uploaded sketches one by one. 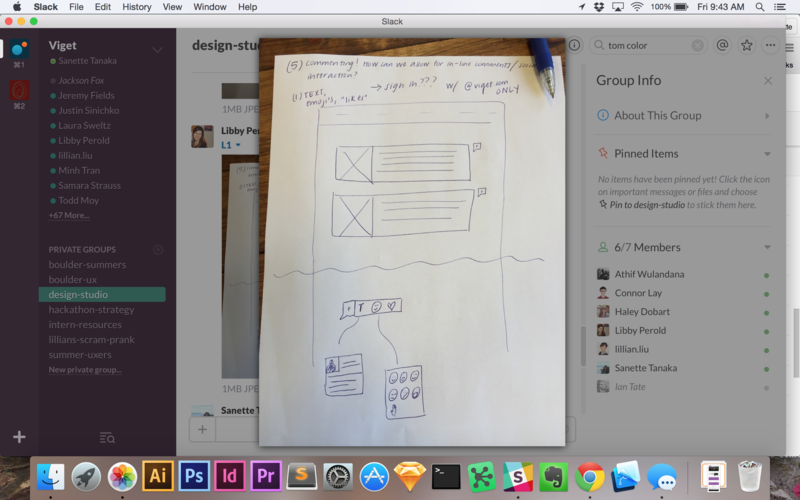 Display sketches via Slack and a Google Hangouts screenshare. One of the main challenges I faced was having to switch repeatedly between applications. I used Chrome to show my presentation deck, Slack to present the sketches, and Pages to take notes on everyone’s feedback. Google Hangouts lets you share a single window or application, or the entire display. I did not want to share my notes with the group, so I ended up switching back and forth between Slack and my presentation deck. In retrospect, I would have nixed the presentation deck completely and posted relevant links and questions in Slack instead. 4. Have participants number their sketches. Numbering sketches makes them much easier to share remotely. 5. Follow up with your team. The studio is over—now what? In a remote studio, it’s important to follow up with your participants, who may wonder what has now become of their sketching efforts. Following our studio, I sent the group a presentation with the sketches, my notes, and conclusions. This helped bring clarity to why their work was important and how it was going to influence the project moving forward. Do you have any tips for remote collaboration? Leave your thoughts in the comments below.